Planning routes manually takes a long time. In addition to figuring out which roads your drivers must take to reach your customers, you also need to account for traffic, weather, construction, customer availability, and other factors. If you have dozens of customers and multiple drivers, this can take hours. Customer-specific delivery restrictions, delays, traffic-stricken areas, challenging loading zones, and perishability of freight are just some of the challenges to your route efficiency. 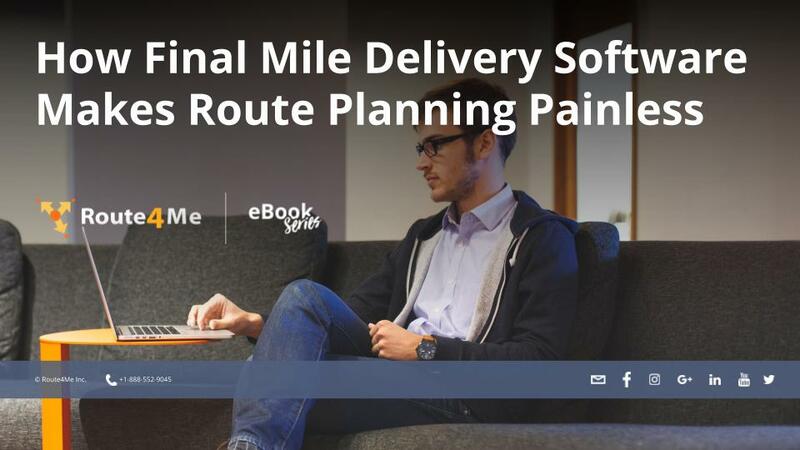 In this eBook, we’ll tell you how a final mile delivery software does just that. It’d be one thing if all this time spent planning routes manually actually guaranteed good results. But that’s not the case. Route planning is so complicated that it’s easy to make a mistake or two when you try to do it by yourself. All it takes is one mistake to delay your drivers and upset your customers. Route optimization software also allows you to provide your drivers with more efficient routes (studies show it cuts travel time by up to 30%). Your drivers will be able to show up on time more often. Your customers will love that! You’ll save a lot of money on gas, too. Of course, optimized routes won’t do you any good if your drivers don’t actually follow the routes you give them. That’s why you must make sure that the route planner you invest in has a GPS tracking feature. With GPS tracking, you can see where your drivers are and how fast they’re going in real-time. Whenever you want, you can check in on a driver to confirm that they’re sticking to their route and staying on schedule. Download this eBook to learn more about our final mile delivery software.